For other uses, see Songhai. Not to be confused with Songye people. The Songhai people (also Songhay or Sonrai) are an ethnic group in West Africa who speak the various Songhai languages. Their history and lingua franca is linked to the Songhai Empire which dominated the western Sahel in the 15th and 16th century. Predominantly a Muslim community, the Songhai are found primarily throughout Mali in the Western sudanic region (not the country). The name Songhai was historically neither an ethnic nor linguistic designation, but a name for the ruling caste of the Songhay Empire. Speakers in Mali have adopted it as an ethnic designation but other Songhay-speaking groups identify themselves by other ethnic terms such as Zarma (or Djerma, the largest subgroup of the Songhai) or Isawaghen. The dialect of Koyraboro Senni spoken in Gao is unintelligible to speakers of the Zarma dialect of Niger, according to at least one report. The Songhay languages are commonly taken to be Nilo-Saharan but this classification remains controversial: Dimmendaal (2008) believes that for now it is best considered an independent language family. 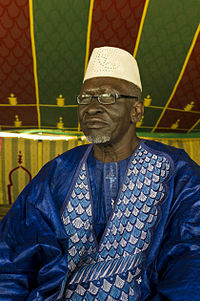 A man of the Songhai people from Mali, in 2012. Hausa, Toubou, Kanuri (in Niger). Following Askia Muhammad, the empire began to collapse. It was enormous and could not be kept under control. The kingdom of Morocco saw Songhay's still flourishing salt and gold trade and decided that it would be a good asset. The Dendi people are a subgroup of the Songhai. A Gorom-Gorom market selling Songhai pottery. The language, society and culture of the Songhai people is barely distinguishable from the Zarma people. Some scholars consider the Zarma people to be a part of and the largest ethnic sub-group of the Songhai. Some study the group together as Zarma-Songhai people. However, both groups see themselves as two different peoples. The Songhai people have traditionally been a socially stratified society, like many West African ethnic groups with castes. According to the medieval and colonial era descriptions, their vocation is hereditary, and each stratified group has been endogamous. The social stratification has been unusual in two ways; it embedded slavery, wherein the lowest strata of the population inherited slavery, and the Zima, or priests and Islamic clerics, had to be initiated but did not automatically inherit that profession, making the cleric strata a pseudo-caste. Louis Dumont, the 20th-century author famous for his classic Homo Hierarchicus, recognized the social stratification among Zarma-Songhai people as well as other ethnic groups in West Africa, but suggested that sociologists should invent a new term for West African social stratification system. Other scholars consider this a bias and isolationist because the West African system shares all elements in Dumont's system, including economic, endogamous, ritual, religious, deemed polluting, segregative and spread over a large region. According to Anne Haour – a professor of African Studies, some scholars consider the historic caste-like social stratification in Zarma-Songhay people to be a pre-Islam feature while some consider it derived from the Arab influence. The different strata of the Songhai-Zarma people have included the kings and warriors, the scribes, the artisans, the weavers, the hunters, the fishermen, the leather workers and hairdressers (Wanzam), and the domestic slaves (Horso, Bannye). Each caste reveres its own guardian spirit. Some scholars such as John Shoup list these strata in three categories: free (chiefs, farmers and herders), servile (artists, musicians and griots), and the slave class. The servile group were socially required to be endogamous, while the slaves could be emancipated over four generations. The highest social level, states Shoup, claim to have descended from King Sonni 'Ali Ber and their modern era hereditary occupation has been Sohance (sorcerer). The traditionally free strata of the Zerma people have owned property and herds, and these have dominated the political system and governments during and after the French colonial rule. Within the stratified social system, the Islamic system of polygynous marriages is a norm, with preferred partners being cross cousins. This endogamy within Songhai-Zarma people is similar to other ethnic groups in West Africa. The Songhai people cultivate cereals, raise small herds of cattle and fish in the Niger Bend area where they live. They have traditionally been one of the key West African ethnic groups associated with caravan trade. ^ "Niger". Ethnologue. Retrieved 4 November 2015. ^ Dimmendaal, Gerrit. 2008. Language Ecology and Linguistic Diversity on the African Continent. Language and Linguistics Compass 2(5): 843ff. ^ "The Story of Africa- BBC World Service". Retrieved 4 November 2013. ^ a b c Abdourahmane Idrissa; Samuel Decalo (2012). Historical Dictionary of Niger. Scarecrow Press. pp. 474–476. ISBN 978-0-8108-7090-1. ^ Don Rubin (1997). The World Encyclopedia of Contemporary Theatre: Africa. Taylor & Francis. p. 212. ISBN 978-0-415-05931-2. ^ Boubou Hama (1967). L'Histoire traditionnelle d'un peuple: les Zarma-Songhay (in French). Paris: Présence Africaine. ISBN 978-2850695513. ^ a b Jean-Pierre Olivier de Sardan (1984). Les sociétés Songhay-Zarma (Niger-Mali): chefs, guerriers, esclaves, paysans. Paris: Karthala. pp. 56–57. ISBN 978-2-86537-106-8. ^ a b c d Anne Haour (2013). Outsiders and Strangers: An Archaeology of Liminality in West Africa. Oxford University Press. pp. 95–97, 100–101, 90–114. ISBN 978-0-19-969774-8. ^ Declan Quigley (2005). The character of kingship. Berg. pp. 20, 49–50, 115–117, 121–134. ISBN 978-1-84520-290-3. ^ Bruce S. Hall (2011). A History of Race in Muslim West Africa, 1600–1960. Cambridge University Press. pp. 15–18, 71–73, 245–248. ISBN 978-1-139-49908-8. ^ a b John A. Shoup (2011). Ethnic Groups of Africa and the Middle East: An Encyclopedia. ABC-CLIO. pp. 265–266. ISBN 978-1-59884-362-0. ^ Bonnie G. Smith (2008). The Oxford Encyclopedia of Women in World History. Oxford University Press. pp. 503–504. ISBN 978-0-19-514890-9.